Thank you so so so so so much for all your shouts of "hooray!" and "awesome!" to Matt's building project. It's so amazing to know that you appreciate this labor of love and it encourages him more than you know, so thank you for that. :) I'll hopefully have another "home tour" in a couple days to show you. 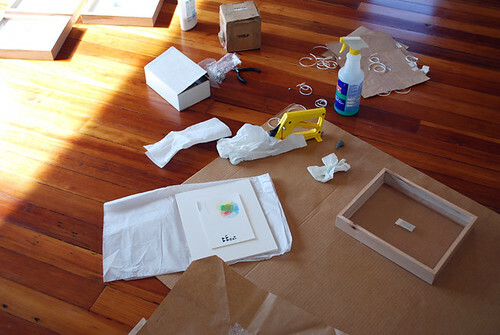 Today I want to share a little of the framing process for the four pieces I made for the Incredible Print Show. It opens at artstream this Friday with a reception on Saturday! Yay!! It has an amazing group of artists involved and whom I would love to meet in person. 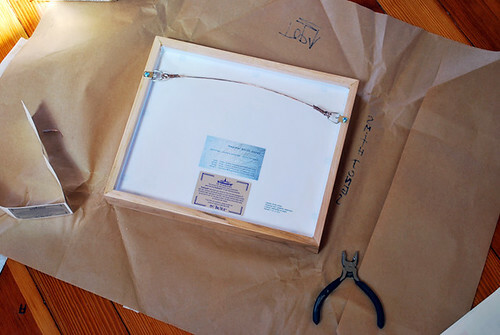 I took the pieces to a local frame shop to mat, with archival mats and materials. The woman who did the matting, her boyfriend works for/with my husband. And my husband made the frames using reclaimed maple from tongue and groove flooring. 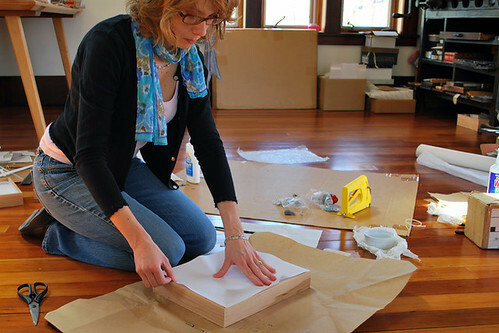 Me adding the dust cover to the back of the work. Here's what the back looks like. I always use a glass with a uv coating to protect the art and add that sticker so the future buyer will know. 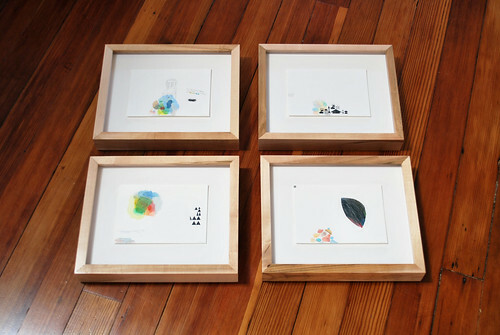 And here are the four framed pieces I'll have in the show. Oh, I added a IPS button in the sidebar of my blog too for direct access to a whole host of prints!